They call it “camping” for a reason. 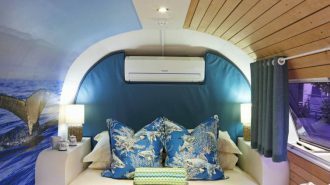 And if you’re spending your whole trip cuddled up inside on the couch, well… that’s a pleasant enough experience, of course, but you’re ultimately missing out on a whole swath of what your RV can do for you! Taking advantage of your travel trailer or motorhome’s outdoor opportunities is essential for truly experiencing the #RVlife. 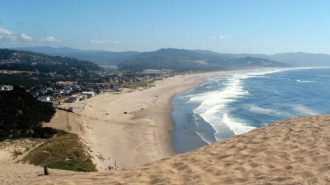 And with so many of our favorite RV parks and campgrounds situated in beautiful wilderness locations, it’s not hard to get outside and experience them first hand — whether that means hiking, canoeing, or just having a picnic at the park. But you can also enjoy the wonders of nature without ever stepping foot outside of the RV park! 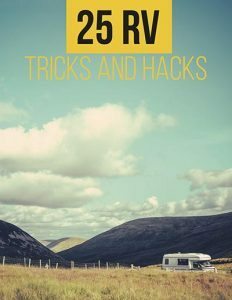 There are tons of cool RV gadgets, accessories, and outdoor furniture sets that make spending time outside way more appealing than even the most comfortable RV couch. And when you inevitably make friends around the campground, having the right furniture on board makes outdoor entertainment a whole lot more inviting, giving you all the space you need to host campfire s’mores roasts, cold beers over freshly-grilled delights, and more — all while enjoying the natural beauty that likely brought you to the camping lifestyle in the first place. How can you go wrong? So we put together this post listing not only some of the best outdoor patio furniture we’ve come across, but a host of other gizmos and gadgets you may not have realized existed — but which, once you do, you’ll totally want to add to your RV packing list. Without further ado, here are our favorite outdoor entertainment items, whether you’re looking for a glamping experience or for something a little bit closer to roughing it. 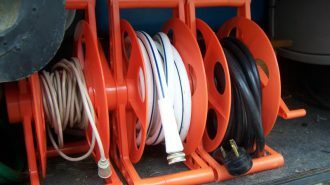 The most important part of any outdoor entertainment setup? The furniture that’ll keep you and your guests comfy and cozy while you’re spending time with Mother Nature. If your only option is the hard, wooden bench provided by the campground, chances are you’re going to be turning in well before bedtime. 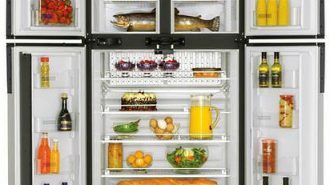 Before we dive into some of the many options available on today’s market, do keep in mind that how much stuff you’ll be able to put out will vary depending on where you’re staying. 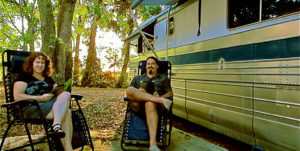 Some campgrounds actually include wrought-iron chairs and outdoor tables as part of their premium campsites, while other spots may not offer the space you need to lay out everything you’ve brought along. If you’re going to be emphasizing outdoor entertainment, we recommend choosing campsites that boast large patio spaces, preferably with concrete slabs or gravel to help keep you and your furniture dry and comfortable. 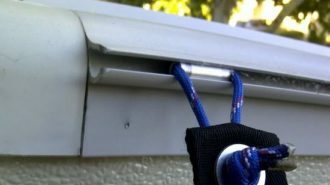 But with the right tools, you can create a relaxing front porch experience even when you’re boondocking off-grid. 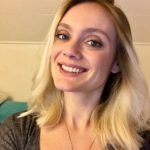 Here’s what you need to make it happen! 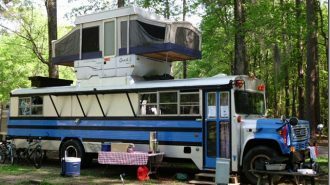 Your RV’s canopy transforms the side of your rig into a living space by providing shelter from the sun and the elements. 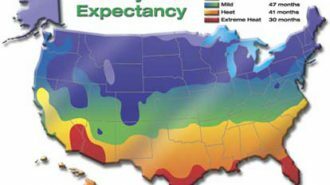 But your feet — and the feet of your furniture — need protecting, too! A high-quality ground mat is a must-have item for any camping party that wants to spend significant amounts of time outdoors. After all, some of the campgrounds you stay in might have fancy concrete slab footing… but it’s unlikely you’ll find it at every single one. Plus, a ground mat will keep mom smiling since it’ll make it a lot less likely that everybody will track dirt and mud into the rig when they go inside to grab a snack or use the bathroom. All in all, it’s a small investment for all the utility it’ll provide you! 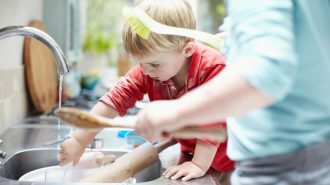 We don’t know about you, but one of the things we most value on vacation is not spending our time doing chores. Outdoor tablecloths can make for easy cleanup once you’re done with your entertaining, since they can be easily thrown in the washer for next time — or in the case of disposables, just thrown away and replaced entirely. Of course, you don’t want those tablecloths to come off before you’re done with dinner, and depending on where you’re camping, the ambient breeze could have other plans. So invest in a package of reusable tablecloth clips to complete your outdoor picnic set! If you’re doing this party the right way, you’re not going to be headed inside just because the sun’s gone down. If anything, you’ll just be getting started! 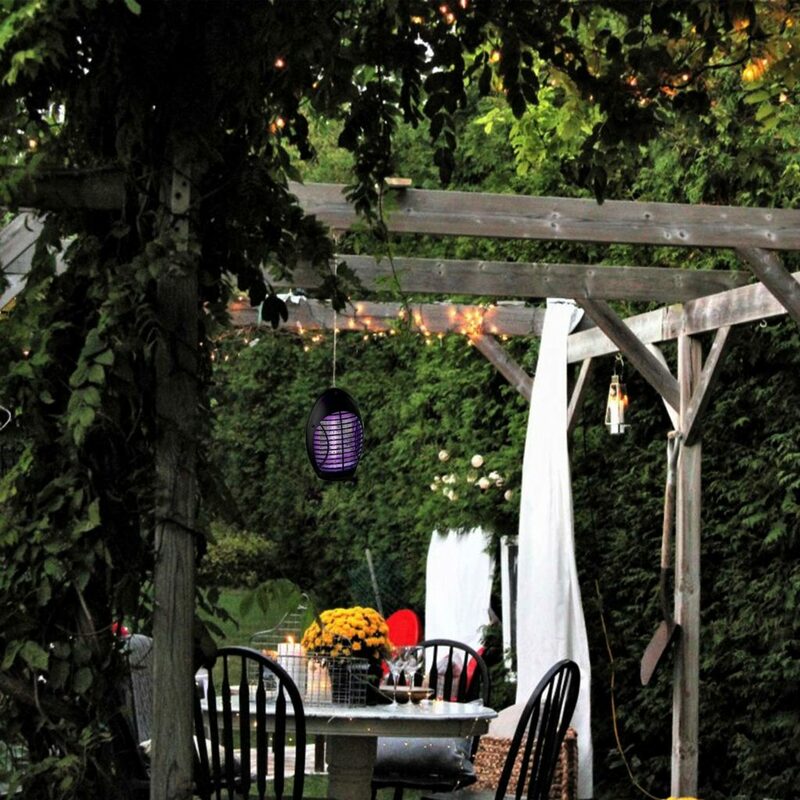 Purchasing some cute and effective outdoor lighting will make your entertainment space much more inviting for guests staying after hours… not to mention keeping people from accidentally tripping when they move around. We’ve written before about some great LED camping lights to consider, which have longer-lasting batteries and don’t get as hot as traditional lighting. But this is definitely an area where you can get a little bit creative. 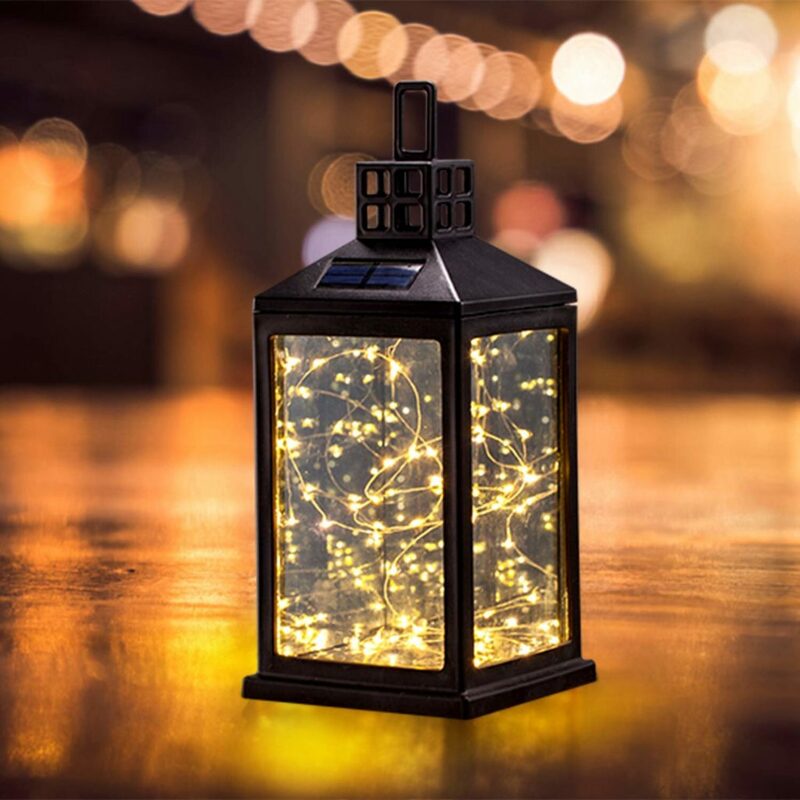 Tabletop lanterns are great, but what about these clever staked torches for your walkway, or these whimsical fairy string lights to bring a touch of wonder to your patio? Getting covered in sticky bug spray may be a camping tradition… but it’s okay for some traditions to run their course. If you’re going to be sitting outside for any length of time in a place like Savannah or the Great Smoky Mountains, you’re going to encounter bugs — and let’s be honest, they’re just not invited to the party. Although bug zapping machines like these are available at shockingly affordable prices — $25 or so will put you in business — there is also an analog equivalent: citronella candles! These affordable and all-natural candles have been used as an insect repellent for years, and they add a touch of aromatherapy to your outdoor experience, to boot. You could even double down and do both! When it comes to outdoor patio furniture, this is where the rubber meets the road. 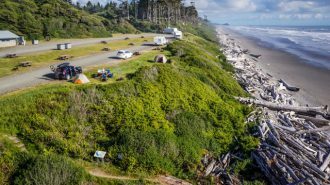 Chances are your campground will provide a flat surface, like a picnic table — but unless you want to be sitting on those rock-hard wooden benches all night, you’re going to need some alternative options. Just because something’s a classic doesn’t mean it can’t be improved upon! Unlike the cheapo chairs you find in just about every camp store, these Homall “zero gravity” chairs are well-padded and sturdy — and they even recline, if you need a little siesta. The designers have thought of everything, also including convenient tray tables and cup holders to keep all of your favorite items close at hand. And they still fold down small, which makes for super easy storage — which is always a concern to savvy campers, who know even that under-cabin basement space is limited! Little campers need a comfy place to sit, too! 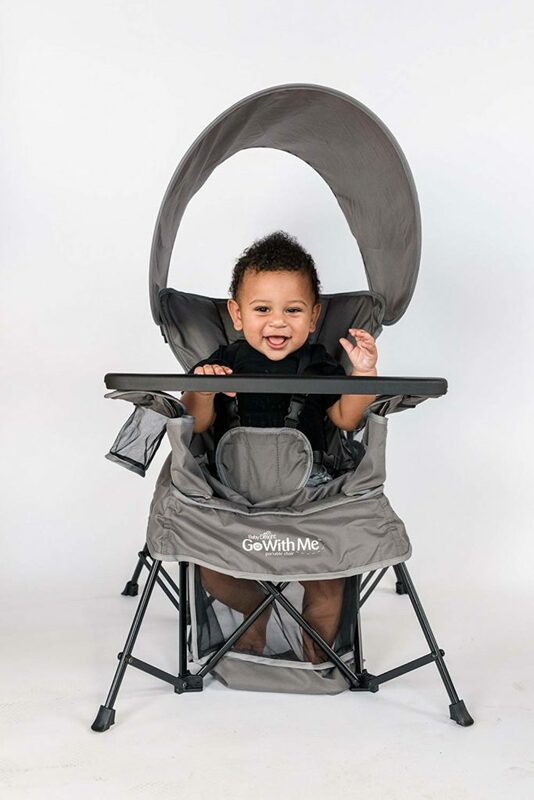 This infant-sized folding chair is good for both indoor and outdoor use, and it converts for sitting, standing, and, and big-kid capability, supporting children up to 75 pounds. It also includes a removable snack tray and sun canopy to keep junior well-fed and shaded, and folds down small for easy storage and portability. Plus, it comes in seven colors, including fun bright shades like lime green and pink — so your kid will be coolin’ it in style! Who says uber-comfy lounge seating has to be limited to the indoors? 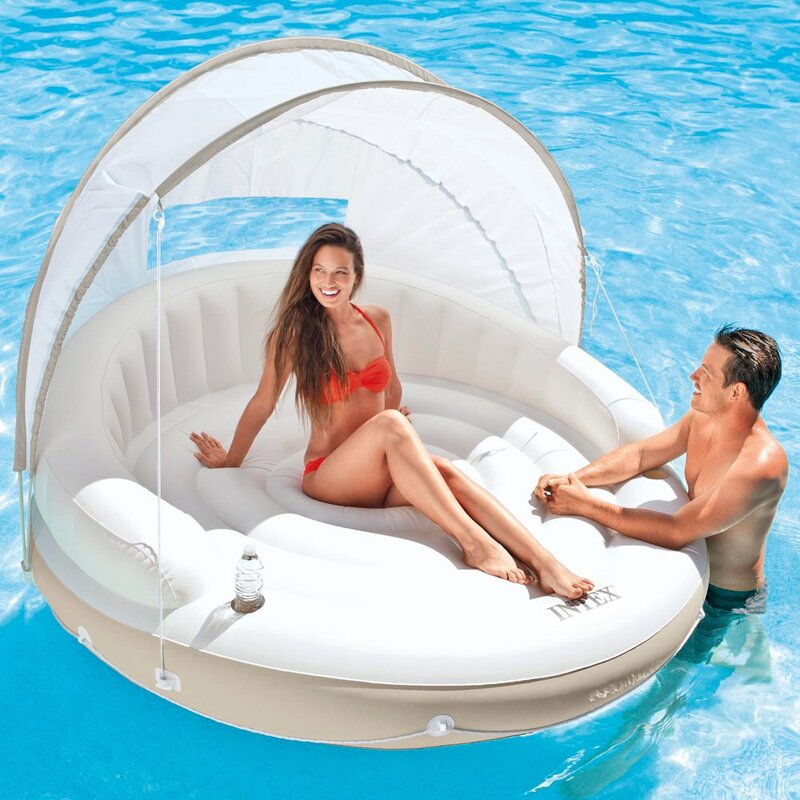 This inflatable lounge chair comes complete with an ottoman, so you can literally kick your feet up — no matter where those feet happen to have taken you. What’s more, the chair is equally good for both indoor and outdoor uses, so you can even use it as extra seating if you’re holding an indoor soiree (or if the weather decides your outdoor gathering isn’t meant to last as long as you’d like). Have we mentioned that the whole thing is available for less than $50 with Amazon’s free shipping? Pretty great deal, right? You’ve got the chairs and the table is covered. You’ve even got the bugs zapped and the mood lighting on. But before you call your outdoor entertainment area “complete,” check out these fun gadgets and accessories — which can really catapult your outdoor entertainment game to the next level. 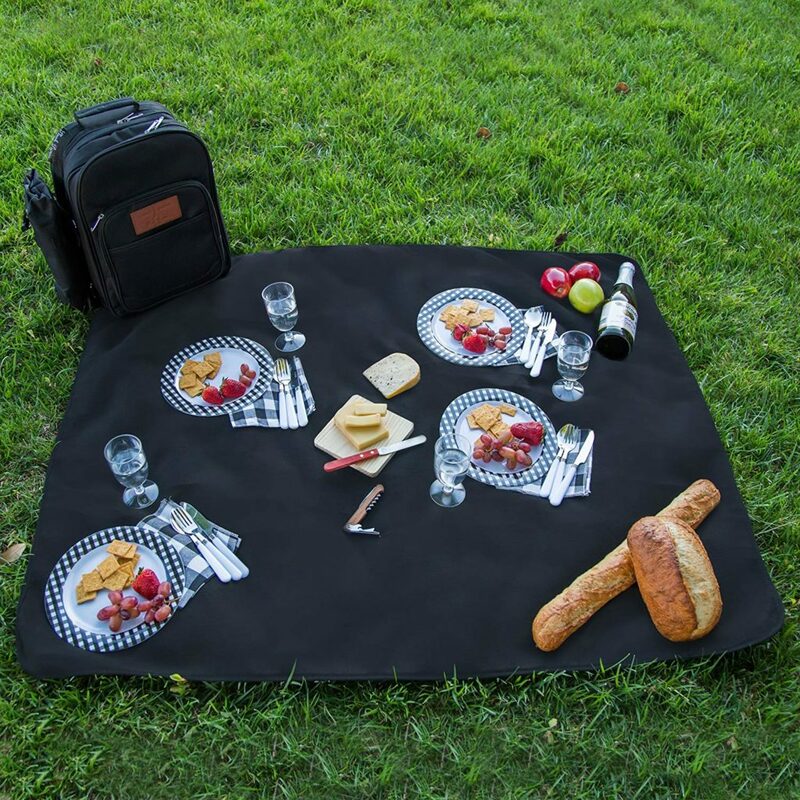 A classic picnic basket has some charm, to be sure… but it’s hard to argue with an all-inclusive, insulated picnic bag complete with a detachable wine bottle holder, plates, cutlery, and a fleece blanket. You have literally everything you need all in a convenient, normal-looking backpack, which is perfect for those times you want to take the party a little further afield than your RV patio. But a bag meant just to handle the wine part of the picture? That could still be a very helpful device! This EVA molded 3-bottle wine bag is insulated to keep your vino chilled to the appropriate temperature, whether it’s a frosty chardonnay or a just-slightly-below-room-temperature pinot noir. 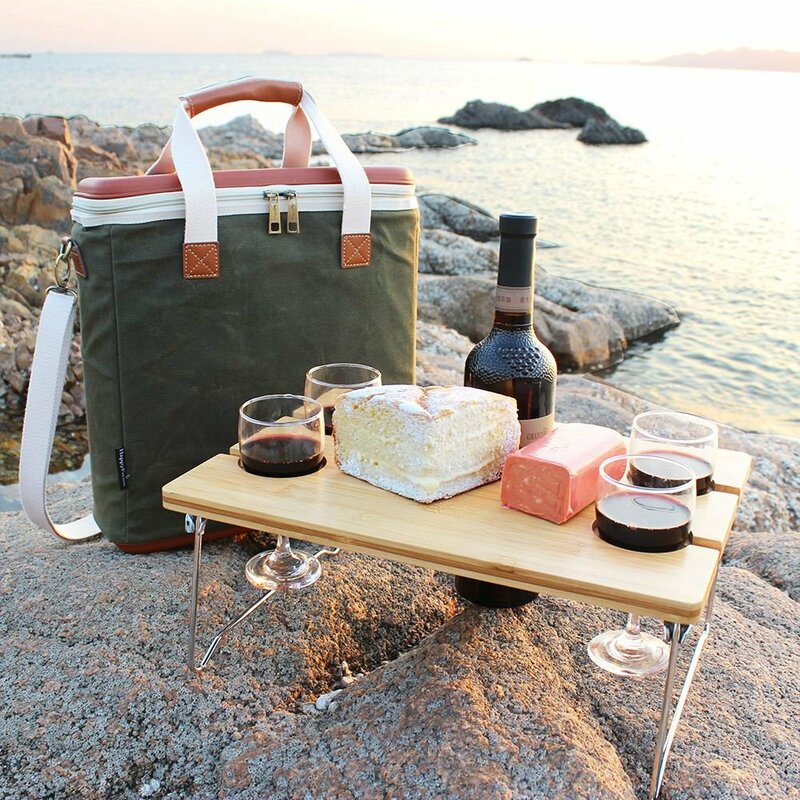 It comes complete with four shatter-resistant wine glasses, an all-in-one wooden corkscrew, a wine bottle stopper, and even a cheese set… just in case you decide you do want to bring along a little snack. The board even has spots for the wine glasses to sit, and legs to keep it up off the ground, which means you can take your mini-picnic right at your patio or somewhere else in the park… like the pool, perhaps? This set also makes an amazing gift for a birthday or anniversary, especially when you fill it with wine and cheese before you hand it over! For many campers, “outdoor dinnerware” means one, slightly sad, thing: disposable paper or plastic plates that frequently bend if you load them with so much as a scoop of macaroni and cheese. Along with being bad for the planet (and a stinky garbage-can stuffer), these plates are expensive over time, and, let’s be honest, they’re just not that much fun to eat off of. But you can dine outdoors without resigning yourself to sad disposables! 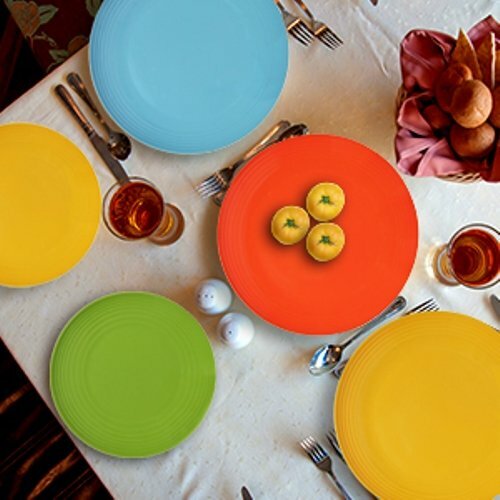 All you need to do is purchase some shatter-proof dishware, like this 12-piece Melamine set. It comes in cheerful colors, is shatter- and chip-resistant, and eating off it won’t make you feel like you’re being punished. Finally, don’t overlook your cutlery! Plastic knives, forks, and spoons have simply got to go. You can use a regular-old metal set like you’d purchase for your home or RV interior, but there’s also something to be said about the specially-made camping cutlery sets, which are both lightweight and sturdy. Some of them even come complete with chopsticks and straws, for when you’re feeling fancy! If there’s one thing that’s absolutely non-negotiable when it comes to camping, it’s outdoor cooking — and not all RV parks and campgrounds offer an outdoor fire pit or grill. To ensure your outside kitchen stays functional no matter where you set it up, our best advice is to invest in a portable grill of your own. You can decide between a teeny, table-top charcoal grill or something more advanced (like this portable stand-up propane grill by Coleman), but no matter what you do, you want to make sure you can keep on cookin’! 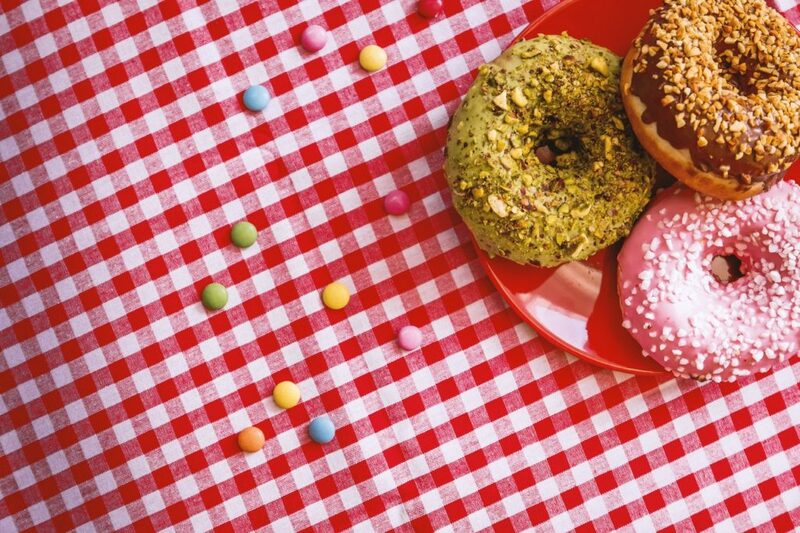 Although classics like hot dogs and burgers are a must, a properly-manned grill can serve up all sorts of unexpected delights, including desserts. You can even make it work as an outdoor pizza oven — especially if you purchase a grill-safe pizza stone! For lots more information about how to become the official campground grillmaster, check out our guide post for RV grillers. Want to get really old school the next time you whip up one of your favorite grilled treats during a camping trip? 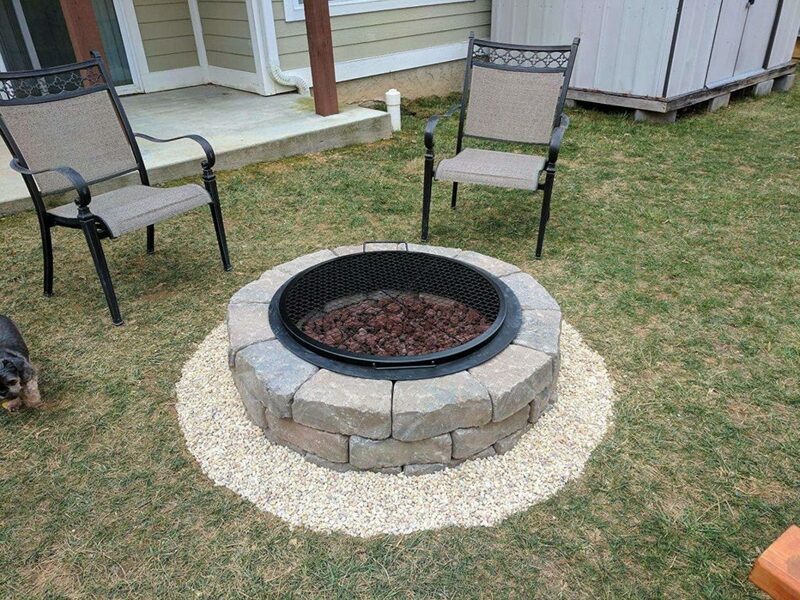 Consider ditching the modern grill for a campfire grill grate, which turns any open flame into a cooking area. There’s nothing quite like the experience of starting a fire and cooking a fresh meal over it — especially if you start the fire by hand (i.e., without help from accelerants) and the dinner is something you personally hunted or caught! Camping at its very best, not to mention a way to feel a little bit more connected to, and grateful for, your food. We recommend starting out with a standard grill accessory set, especially since you can purchase an all-inclusive kit for less than $50. Most, like this one on Amazon, come with a neat carrying case, and keep you covered for the basics: spatula, tongs, brush, and scraper. 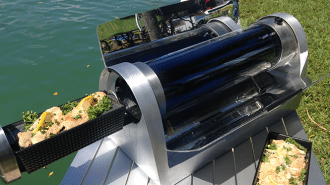 Then you can start adding in some more creative extras, like a grill basket, which makes barbecuing up smaller items, like vegetables, or shrimp, a whole lot easier. Into Mediterranean eats — or just ones that offer fork-free simplicity? 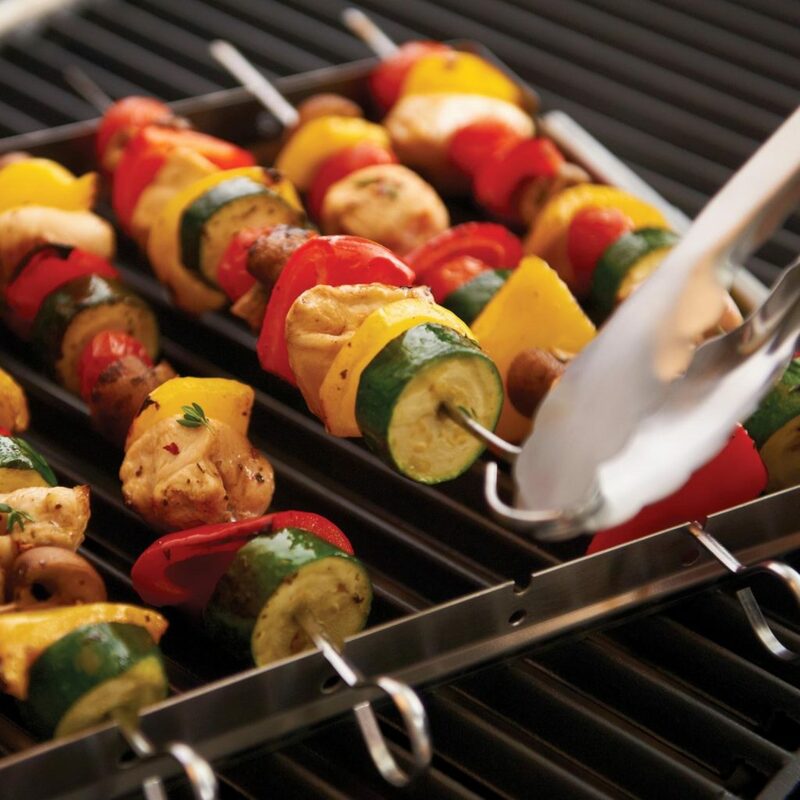 Consider investing in a metal kebab set, for a waste-free, reusable answer to those annoying wooden skewers. 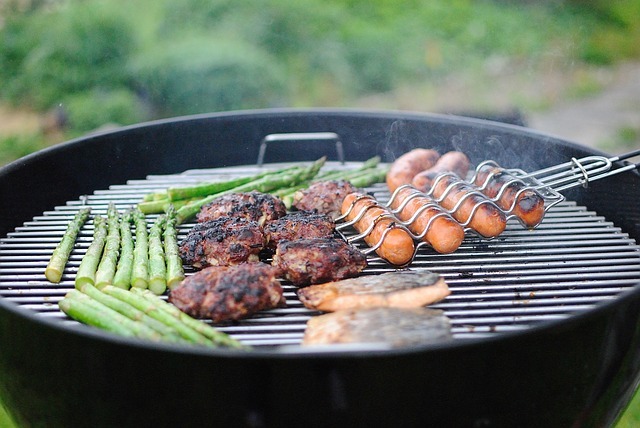 You can also put together your own set of grill accessories a la carte, purchasing essential items like grill brushes and spatulas at your leisure from your favorite vendors and makers. And whatever you do, don’t forget a meat thermometer! You certainly won’t garner any grillmaster points by inadvertently giving someone food poisoning. 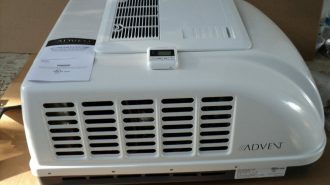 So complete your outdoor entertainment setup by showing that pride. 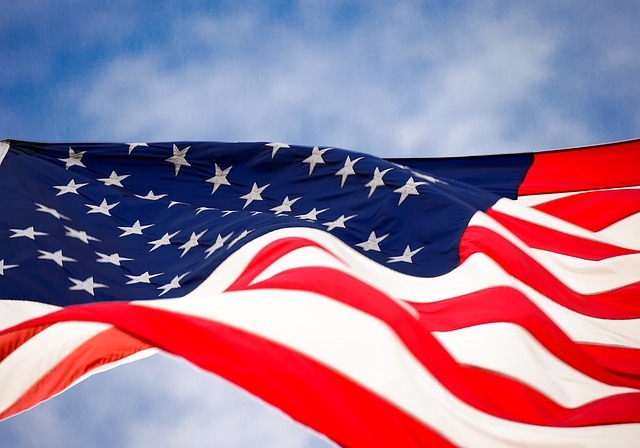 Investing in a weatherproof American flag is one of the best ways to display your patriotism, and besides, the stars and stripes are just plain-old pretty. You can easily mount your flag on the arms of your RV awning, or invest in a foldable flag pole if you want a more imposing setup. Either way, you and your campground neighbors will have the chance to remember exactly how lucky we all are to be living in and exploring this country of ours every time they glance in your camper’s direction. 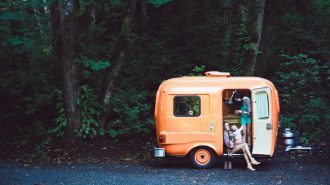 If you’re a fan of spending time outdoors, it’s no secret that RVing is one of the best ways to do so. 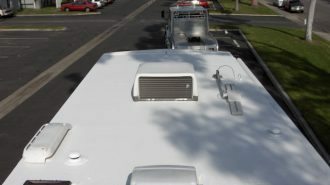 When you hit the road in a travel trailer or motorhome, you combine all of the freedom and flexibility of road tripping with the comfort and convenience of having your very own roof over your head — not to mention your own bed, bathroom, and kitchen! 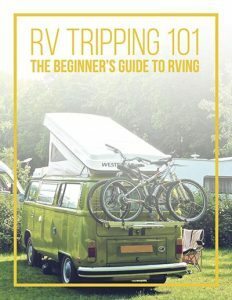 Fortunately, you’ve stumbled upon the right resource here at RVshare. 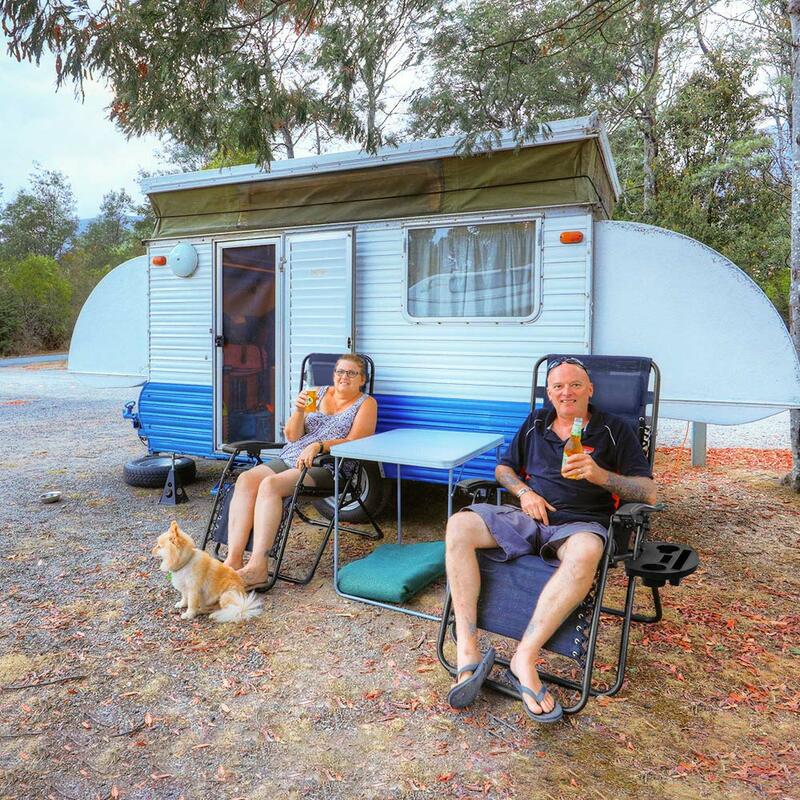 Because along with providing some of the highest-quality rental vehicles in the business at some of the very best prices, we’re also committed to helping you make your journey a success with the latest and greatest in camping tips and advice. 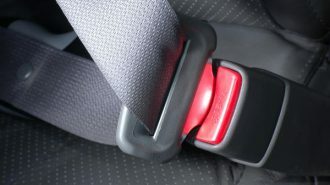 But there are lots of ways to save money on the road without sacrificing the awesomeness of your vacation. 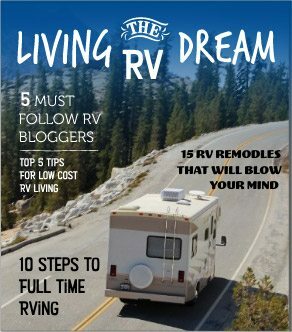 Our first suggestion (spoiler alert) is securing your RV rental through RVshare. Renting on the peer-to-peer market helps you save money because you’re renting from trusted, local owners — i.e., adventurers just like you. 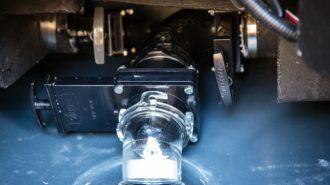 They don’t have to worry about the hefty overhead costs of running a traditional RV rental business, so they can afford to pass on those savings in the form of much lower per-night rental prices. 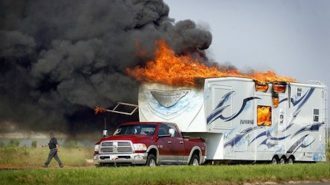 We also offer some of the best insurance coverage in the RV rental industry. Each of our rentals is secured with A-rated coverage from the moment you grab the keys until the moment you drop them off, and we also have optional 24/7 roadside assistance access. All communications and monetary transactions take place through our secure platform, so you never have to worry about the safety of your sensitive information. If you want to live in the lap of camping luxury without paying luxury prices, you’ve absolutely got to get a Passport America membership. There are a whole lot of RV camper discount clubs out there to choose from, but this one might just be our favorite — and here’s why. Passport America is straightforward and simple: you sign up, and you get 50% off your campsite accommodation costs at all participating campgrounds. And there are almost 1900 so far, and counting! The membership costs less than $50 per year, and is even cheaper when you sign up for multiple years ahead of time. 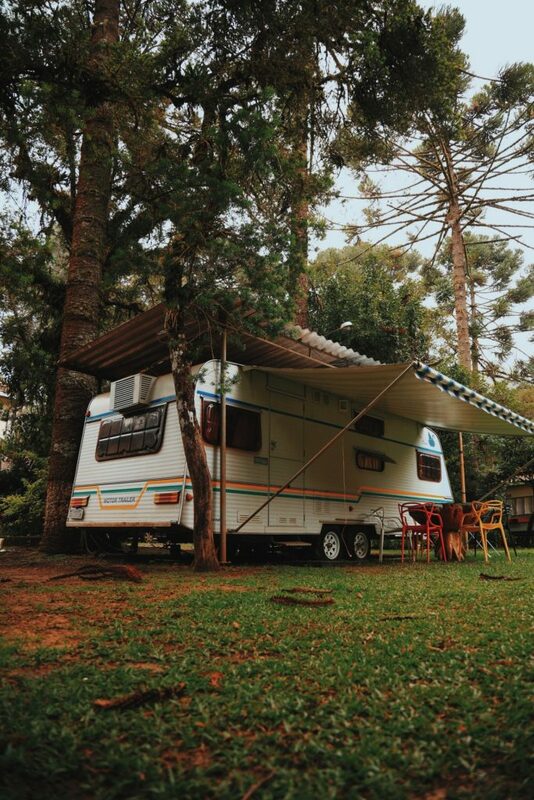 Considering that some of the popular campgrounds in high-traffic areas go for as much as $75 or $100 per night, it’s easy to see how quickly your Passport America membership can pay for itself! 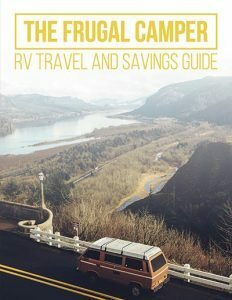 Whether you travel in an RVshare rental, an RV you rent from a traditional dealership, or your very own rig, we hope this post has helped you find the gadgets you need to spend time outside, enjoying nature. 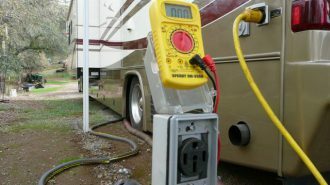 After all, disconnecting from our all-digital indoor reality is one of the most common reasons people take to RVing in the first place — and we guarantee you, the reality outside is way more enjoyable.